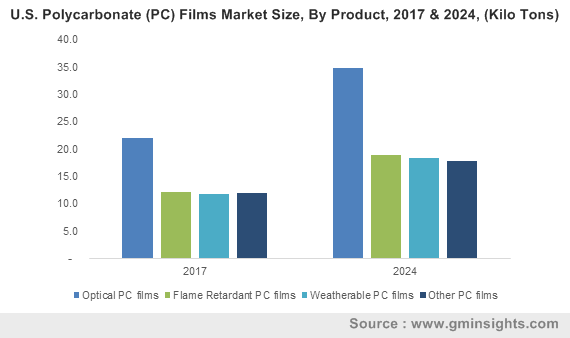 Polycarbonate (PC) Films Market size was over USD 1.4 billion in 2017 and industry expects consumption at over 550 kilo tons by 2024. Rising demand for plastic films primarily for automotive applications on account of reducing vehicle weight and improving fuel efficiency may stimulate polycarbonate films market size. They have superior properties including high elasticity, resistance to abrasion, chemical, heat and moisture which increases their suitability for automotive applications. It comprises of various products such as optical, weatherable, flame retardant and anti-fog films catering to electronics & electrical, medical, agriculture and construction industries, thereby stimulating industry growth. Global automotive market size is likely to surpass USD 5.5 trillion by 2024 which provides various opportunities in the polycarbonate films market demand. 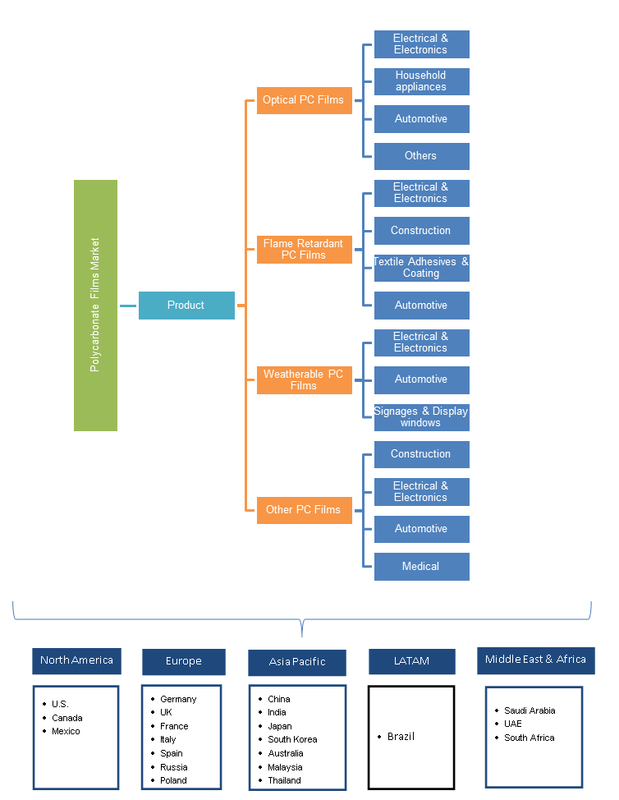 Increasing demand towards automotive applications owing to high light transmission, toughness, dimensional stability and appeal is likely to accelerate growth of PC films market size. Moreover, durability and minimization of ripple in vehicles may further stimulate industry growth. Also, European polycarbonate sheet extruders (EPSE) promotes the usage of these sheets by developing industry standards and supports vast supply chain which generates an array of business services, thereby increasing product demand. Global construction industry may surpass USD 7.5 trillion over the projected time frame. PC films are widely used in building & construction products, from skylights and windows to wall panels, rooftop domes owing to high optical clarity, heat resistance and flammability properties, resulting into increased polycarbonate films market demand. Increasing R&D efforts by producers to achieve lucrative production and higher product efficacy may foster polycarbonate films market growth. Government regulations and policies play a critical role in development of electronics market in China, Japan and India may upsurge the product demand in the region. Global consumer electronics market may surpass 1.5 trillion in the predicted timeframe owing to growing middle-class population coupled with increased usage of electronic devices, which in turn boost industry growth. Manufacturing process of PC films is capital intensive along with usage of hazardous chemicals is likely to hamper market growth in the projected timeframe. High material cost and manufacturing necessities may boost up production costs. However, advanced strategies achieving economical cost along with product enhancement may offer several opportunities in the market. Optical polycarbonate films market demand was valued at over USD 700 million in 2017 and is expected to grow over the predicted timeframe. These products are used in household appliances, automotive interiors and consumer electronics pertaining to their optical clarity, impact resistance and low haze factors. Moreover, superior properties such as resistant to sunlight, rain, heat and snow makes them preferable for building greenhouse with a longer shelf-life without fading or discolouring and cost-effectiveness of these films is likely to facilitate product demand in various countries. Optical PC films market size from automotive applications may register gains close to 7% up to 2024. These blends provide automotive engineers and designers with high performing thermoplastics, lightweight, and fuel efficient thereby reducing the overall vehicle weight. Weatherable polycarbonate films market demand may register gains close to 6.5% over the forecast period. Growing demand for signages, warning labels, outdoor menu boards and automotive may foster PC films market. These products give numerous benefits including extreme durability, printability, abrasion and chemical resistance compared to other products. Signage and display windows applications may witness significant gains over the foreseeable timeframe. Increasing demand for digital promotions of products & services to grab consumer attention, which shows ample growth potential for PC films market. North America driven by Mexico, Canada and the U.S. polycarbonate films may register significant growth over 6.5% up to 2024. Growing healthcare sector with rapid technology advancement and clinical trials is likely to stimulate product demand. Companies are focusing towards investment to serve various end-use application sectors accompanied with implementation of innovative technologies & techniques are the key attributes favouring regional growth demand. Asia Pacific led by South Korea, Japan, India and China polycarbonate films market demand may surpass USD 890 million by 2024. Increasing product adaptability in automotive, electronics, and construction sectors along with continuous expansion & new product development by various companies may stimulate industry growth in the region. Rapid urbanization with growing population which has led the need for automotive and consumer electronics demand in China may contribute towards product demand. Europe driven by UK, France, Spain, and Germany polycarbonate films market demand should register significant gains at around 6% over the predicted timeframe. Increasing demand for recyclable products and reutilization are the key factors to boost the industry. Growing automotive production along with increasing passenger car demand may accelerate the regional growth. These are durable and provide optical defects to replace the heavy metals in automotive industry and generate opportunities for manufacturers to find huge profit in the region. Global polycarbonate films market share is moderately consolidated with major industry players SABIC, Covestro, 3M, Teijin and Wiman. Companies are engaged in mergers and joint ventures to increase their regional presence and focusing on new product development to gain competitive advantage which may boost product portfolio and support global presence of PC films. Moreover, most of the companies are focusing to produce cost-effective and durable products to boost the overall industry growth. Polycarbonate films are produced from PC resin which is recyclable and environmental-friendly material. Increasing consumer demand towards automotive, electronics and construction should propel the product demand. In electronics sector, these are used in connectors, battery boxes and household appliance owing to their flame-resistant properties. Development of higher strength and UV resistant polycarbonate films is likely to offer growth opportunities in the PC films business.